Every year, the deities of the Jagannatha Temple are carried to the Gundicha Temple on the other side of the road on grand chariots, in the world famous Ratha Jatra. During this time, the huge temple remains empty, bereft of its presiding deities. People throng to the other temple where the deities reside during the time. But what happens inside the lonely chambers of the Jagannatha Temple? Out of the hundreds of stories surrounding the Puri shrine, this is one of the lesser-known, unusual ones. The sight was spectacular – huge idols of Balabhadra, Subhadra and Jagannatha being taken out of their main sanctum sanctorum. A huge flower-crown called a Tahia adorned their heads, and they danced as they came, the crown swaying with them. Ecstasy everywhere- people were going crazy- the thunderous clang of thousands of gongs filled the air, spreading the contagious enthusiasm. Jagannatha would refuse to move for a second, and the Pandas would be struggling to move him an inch- another moment, they would carry him like a feather. But one among the crowd was not impressed. The sensory overload was not enough to affect him, for he had learnt how to withdraw from the material world. He watched like a prying predator, while the sea of people around him rose and fell. 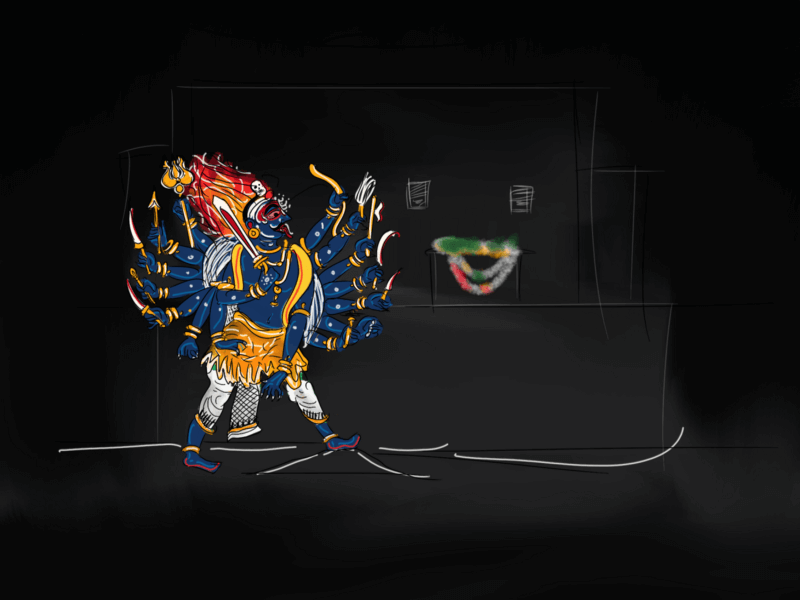 Soon, the Gajapati King arrived and did his traditional ritual. The horses were tied. The charioteer held the ropes. He called out, “Start, people!” The elephants dragged the chariot with men and the huge wheels started rolling. The man now began laughing like one who is mad. It was nothing less than funny to watch a group of people put God in a chariot and drag him away, believing him to have left. What fools! Jagannatha can never leave this temple, his eternal abode. They may take away a wooden idol, but God can’t leave the temple. He must have left the idol. Yes, that was it! Not even looking back at the chariots, the man left. Indraswami, he was. Skilled in the yogic arts, he had undergone years of penance. Nothing could lure him, nothing could frighten him. He had gained unconcern for the world. A great adept, he went back to his humble cottage and sat down for his yoga session. He tried to focus his mind on the Lord, but he failed to have a glance. He tried again and failed once more. Unable to have a mental vision, he proceeded towards the Jagannatha temple. People said that Jagannatha had left, but for him, he hadn’t. He was still at the Srimandir. And so, while people thronged at the Gundicha Temple on one side of the road, he proceeded to the other side. He entered through the huge gates, finally leading to the inner sanctum. There, the Ratnasinghasana, the bejewelled pedestal was empty. No one sat on it. The temple was empty. So was the throne. He was alone in this void. So much had he seen in his life, yet, not a speck of fear had touched him. But now, he felt alone. The silence chilled his bones. He experienced horror in that dark stony chamber. The next day, Indraswami had narrated his sight to the priests. They said that she was none other than Bedhakali — Goddess Kali, who protected the temple. Thinking of his visions, Indraswami realised that this was a land where the deities danced together in their terrible dance. He was reminded of the legendary Tandava, the dance of destruction. He went back to his hermitage and lied down, tired. That night, Indraswami had a vision. Jagannatha himself appeared to him in his dream and told him that he was indeed in the Gundicha Temple. Indraswami woke up, astounded, and rushed towards the other side of the road, where the Lord waited for his devotee.